Dual Pen -Two Color Pen, Personalized in Bulk. 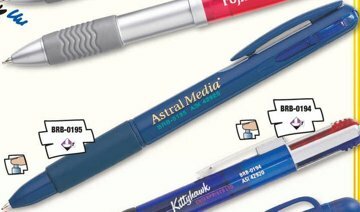 Wholesale personalized dual ink pen provides either blue or red ink of the finest quality at the push of a knob. High gloss plastic barrel with matte ergonomic finger grip brings distinction to your message. Blue and red ink (standard). Great discounted price. Also available blank (not imprinted): see the Price Table Free artwork design, best price in USA and Canada for bulk customized dual ink pens. Free Artwork Design. Estimated Production: 7 working days after art approval; contact us for faster delivery. Imprint color: 1-color imprint only.